One of the most spectacular heroes of the Old Testament is Joshua, the successor to Moses, who caused the walls of Jericho to tumble down with that city's famous trombones. The Israelites' army conquered the promised land of Canaan under his leadership. 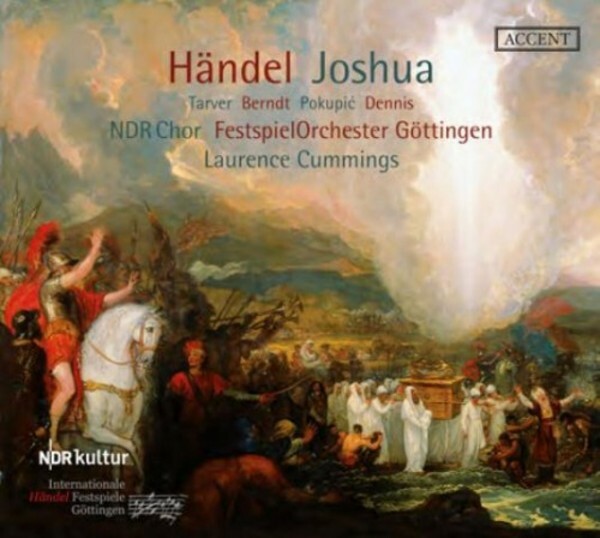 This biblical story supplies the background to Handel's oratorio 'Joshua', premiered in 1748. It was supplemented by a love story involving the young captain, Othniel and Achsah, the daughter of an elder, by the presumed librettist, Thomas Morell. Thus the composer was able to include the entire spectrum of his musical expressivity: the magnificence of tympani and trumpets, joyful and jubilant choruses, virtuoso arias and moving love duets. The present recording is a production of the 2014 International H�ndel Festival in G�ttingen, highly praised by the critics at their performances in Hamburg, London and G�ttingen. Laurence Cummings, the Festival's Artistic Director and a renowned H�ndel specialist, stands at the helm of the G�ttingen Festival Orchestra. The title role of Joshua, with its difficult coloratura passages, is confidently mastered by tenor Kenneth Tarver, who is well schooled in belcanto roles. Anna Dennis (Achsah) convinces listeners with her brilliant soprano voice, as does mezzo-soprano Renata Pokupic (Othniel), with baritone Tobias Berndt lending his character a dignified, elevated radiance. The leading role in Joshua is in fact the choir which embodies the people of Israel, marvellously represented here by the NDR Choir.